Do you want to offer discounts to Club La Nación members in your PrestaShop? This module will allow you in 3 simple steps to add one of the most important loyalty programs of readers of the country to increase the sales of your site. It allows you to keep your customers loyal Get new customers and increase your sales quickly thanks to this module! It will allow you to be part of the sites that offers benefits to the more than 1 million members of Club La Nación. 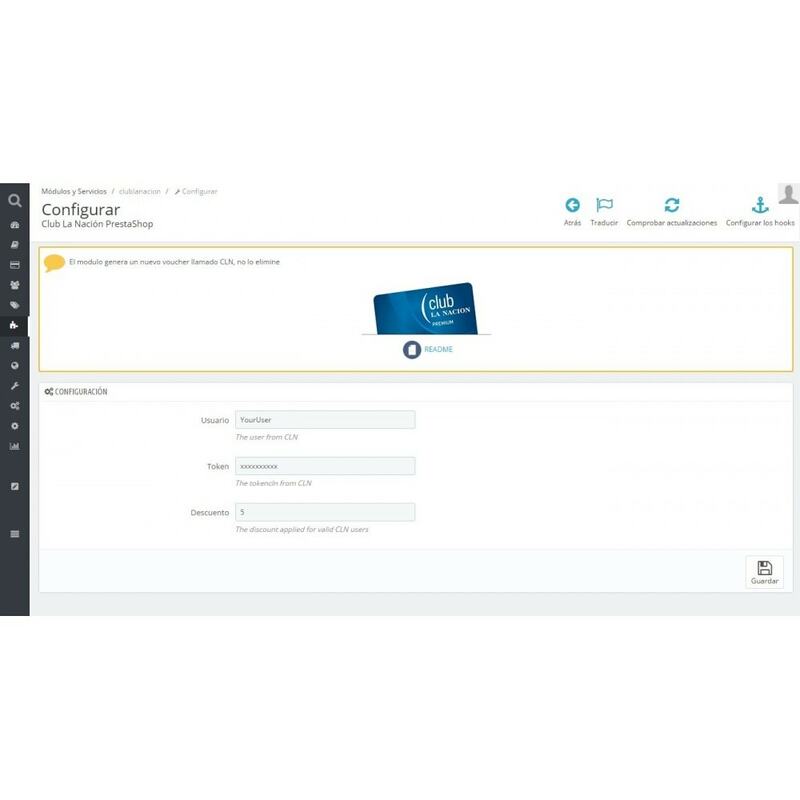 You only have to complete three fields, define the percentage of discount and in a matter of seconds you will have the module ready to operate in your store. Creation and discount configuration of "Club La Nación"
How does the module work? 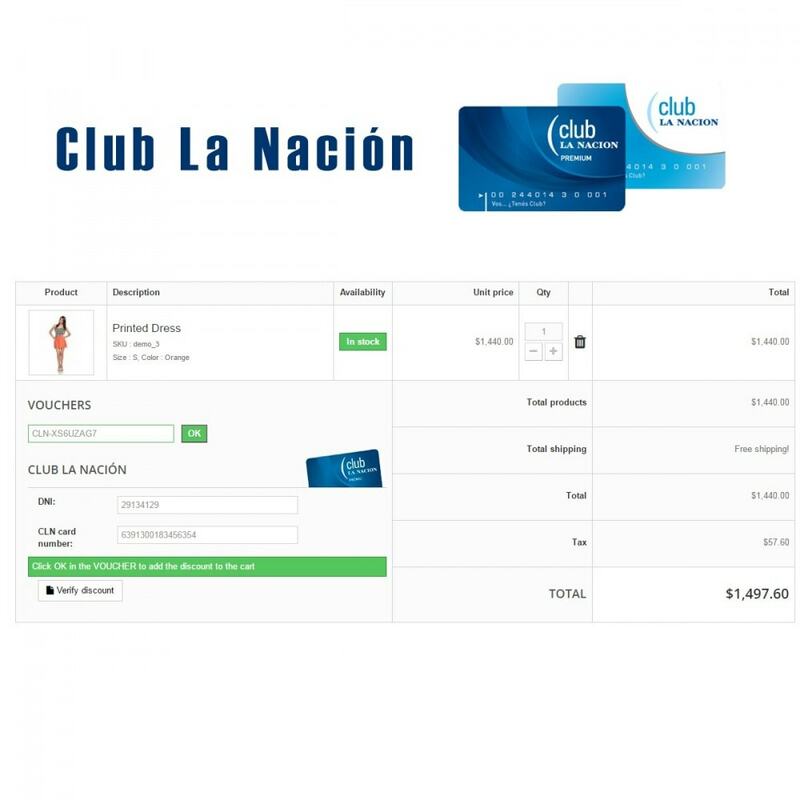 When one of your customers places an order and this one has a "Club La Nación" credential, you can use it to access the previously configured discount by entering your member number and national identity document to validate them. 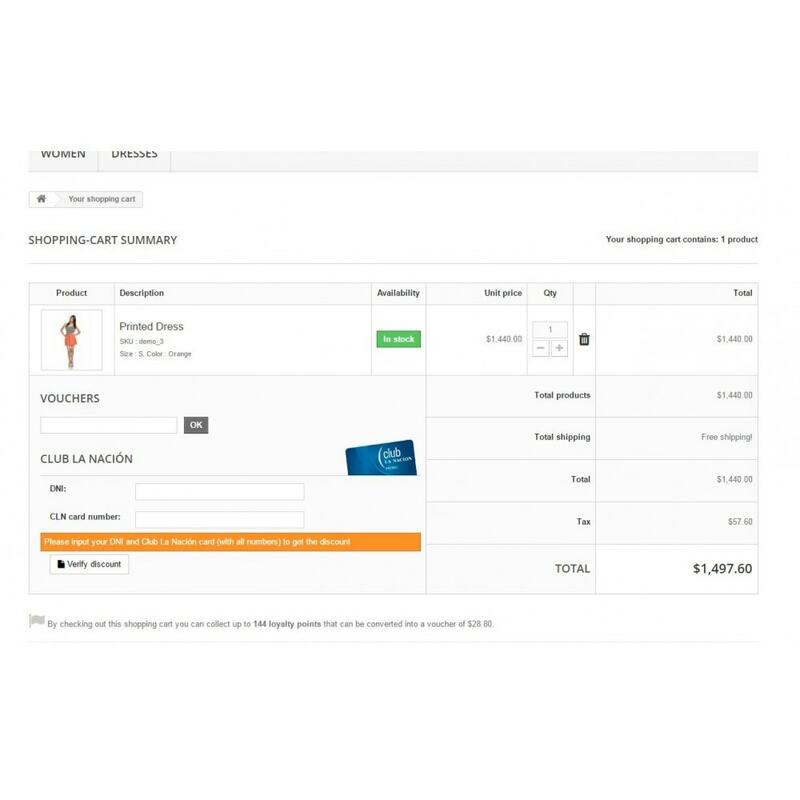 If you meet the conditions, you apply the discount coupon rule created in the module, which will automatically generate a unique discount code for that customer. Where do I find the coupons created for Club La Nación? 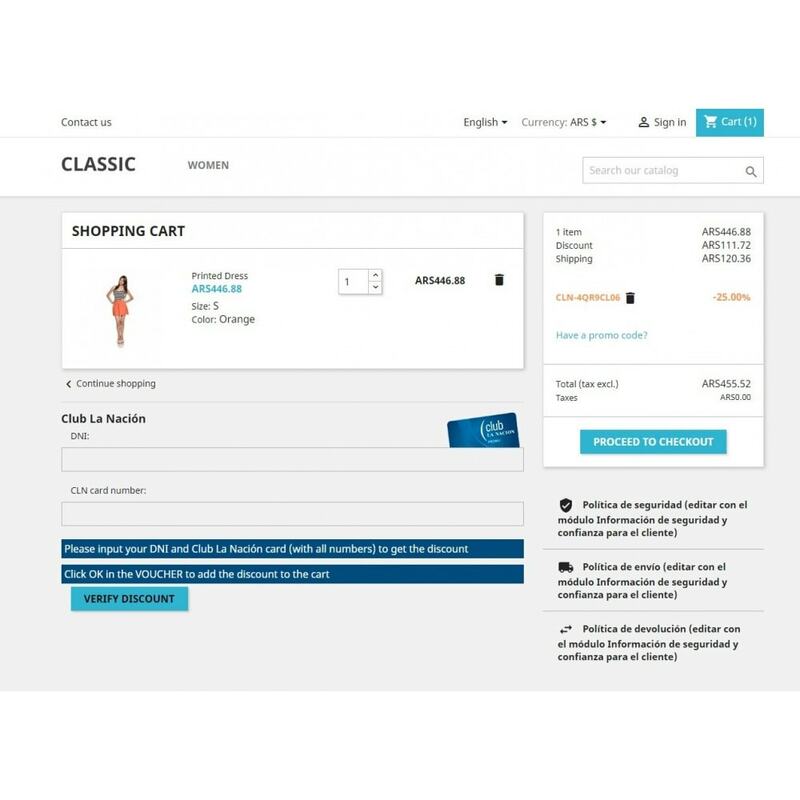 You will find the purchase rules and their codes created by the module in Promotions> Rules of purchase. How do discount coupon rules associated with a category work? 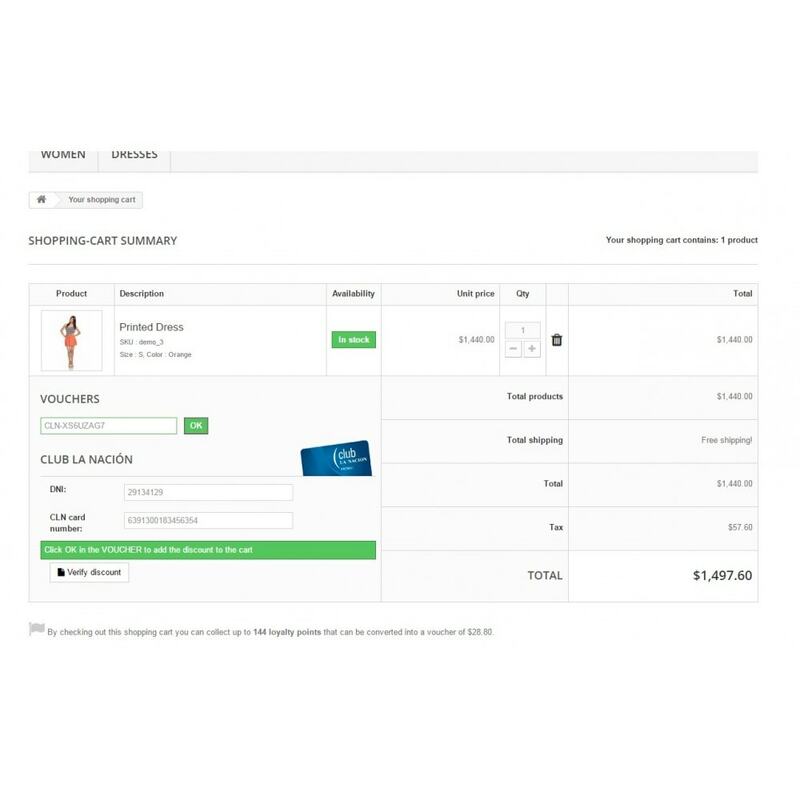 If you set up a discount coupon rule associated with one of your categories (category or subcategory), a discount code will be generated when one of your customers buys one or more products in this category. Find "Club La Nación", one of the most important loyalty programs of Argentina in your store. PHP version 5.4 or higher required. The credentials to be used in the configuration of the module are the user and the token granted by Club La Nación. Instructions attached to the module.